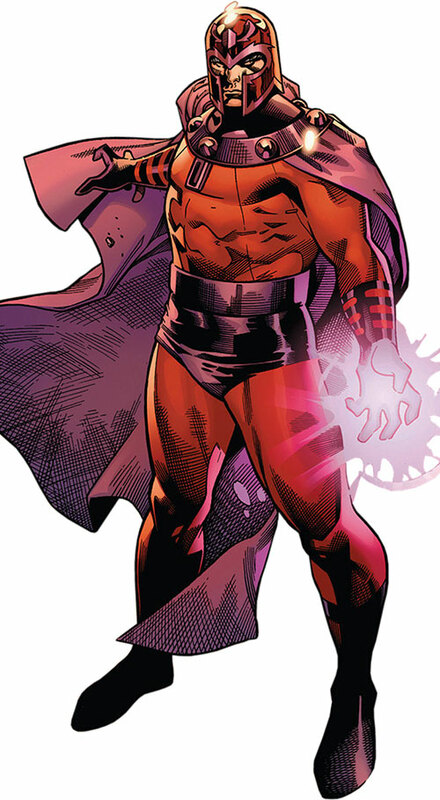 Magneto was the first foe of Marvel Comics’ X-Men, in 1963. He’s a fellow mutant with an overwhelming power over magnetic forces and tremendous intelligence. Magneto remains a major X-Men character to his day. As decades passed, Magneto evolved from a black hat villain to a far more nuanced opponent and frequent ally. The ideological differences between him and Professor X became one of the core dynamics of the X-books. This profile is a gisted profile. Other Aliases: Erik Magnus Lehnsherr, The Creator, The Master of Magnetism, The White King, The Grey King, Michael Xavier, The most feared man in the world, Overlord of the Fatal Attraction. Known Relatives: Magda (wife, deceased), Pietro Maximoff (son), Wanda Maximoff (daughter), Anya (daughter, deceased), Luna (Granddaughter), Crystal (daughter-in-law), Vision (son-in-law), Jakob (father, deceased), Erich (uncle, deceased), Ruthie (sister, deceased), mother (possibly named Cecelia, deceased). Group Affiliation: Genosha Ruling Council. 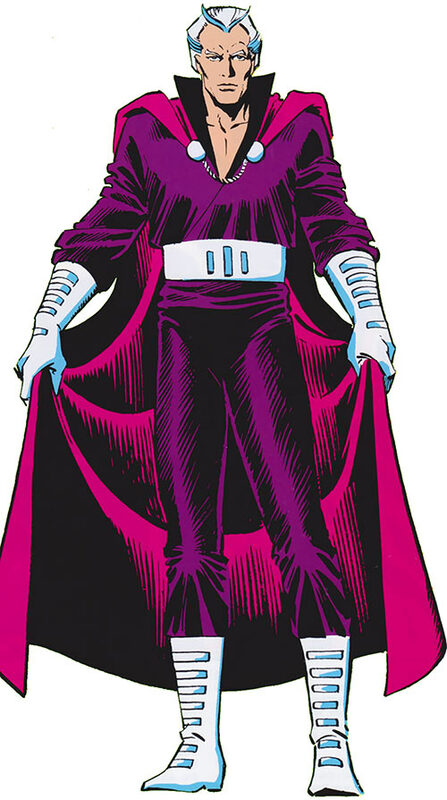 Former member of the X-Men, former leader of the Acolytes and the first Brotherhood of Evil Mutants. Base Of Operations: Mobile, Avalon, Genosha. Magneto is the ultimate master of magnetism. As such, he has access to manipulating electro-magnetic fields, as well as other energy sources, by his sheer force of will. The energies that he can manipulate through magnetism include electricity, gravity and heat. Physically he’s almost superhumanly endurable and can magnetically increase his physical strength greatly. He can project force fields that protect against physical attacks, as well as psionic ones. He can radiate pure energy on many different wavelengths. He has even developed certain telepathic abilities, such as astral travel and though projection. All metals can be manipulated to levitate, to attain any configuration, any crystalline structure or any form of alloy. Human beings can be paralyzed just by holding all the iron content in their blood immobile. So great is his power that he can sink a nuclear submarine by thinking it half a world away or disassemble groups of satellites in orbit. By unleashing all his magnetic might he can temporarily shut the earth down by releasing a powerful electro-magnetic pulse . Being in a constant awareness with the Earth’s magnetic fields, he can sense metallic objects passing by, detect teleporting characters and detect general or specific changes to Earth’s magnetosphere. 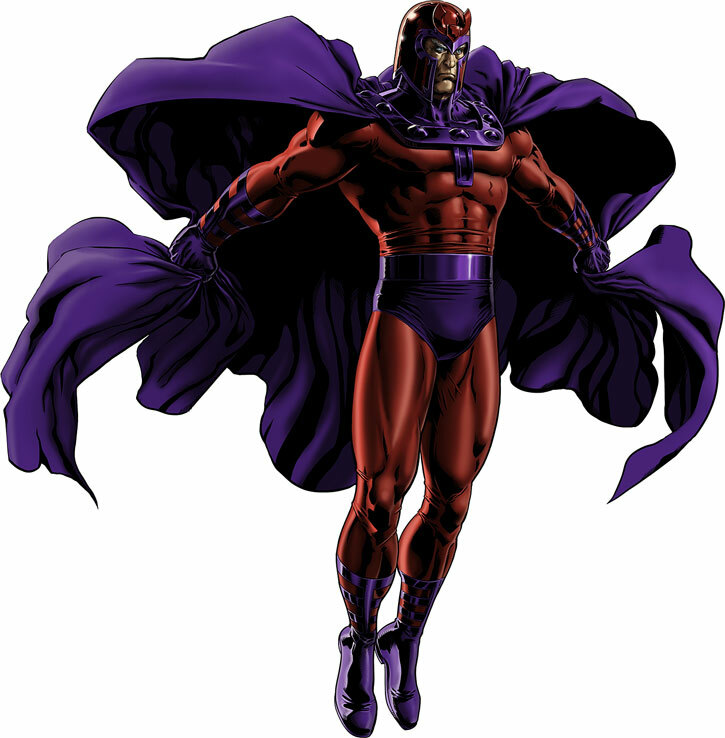 Magneto is also a very intelligent man, capable of designing humanoid robots, weapons, mutating rays, fully computerized headquarters and other ultra-scientific technologies (he, of course, assembles these using his powers). He also speaks many languages and is an excellent speaker and leader. Magneto was born Max Eisenhardt, in the mid-1920s, in Bavaria, Germany. He grew up in Nuremberg in a typical Jewish family of that time. His father Jakob seemingly worked as a watchmaker with his younger brother Erich, whilst his wife (perhaps named Cecelia) was a hausfrau. Max had a sister, Ruthie, whom the Gentiles called Greta. The young boy was very talented at working with metal. Eisenhardt’s formative years were harshly marked by anti-Semitism and the rise of the Nazi party. He suffered from a number of beatings, bullying and injustices. As a kid, he unconsciously used his powers (which he wouldn’t discover until years later) during a javelin-throwing competition at school. This was meant to impress Magda, a Romani girl he liked and the daughter of one of the cleaning women in school. Between this spectacular throw and his excellent academic results (though Max continued the glorious Jewish tradition of otherwise being a lamentable athlete), he was harassed and eventually expelled by the headmaster. Such results from a Jew were unacceptable. His uncle Erich was also beaten and paraded in the street as punishment for having dated Gentile women. Like most Jews Jakob never quite believed that the Nazis would do what they said they would. He tried to protect his family as a German citizen rather than flee. The Eisenhardts narrowly escaped the Kristallnacht raids and riots and left for the only foreign country where they had contacts – Poland. They lived there for a short time before the invasion, and narrowly escaped the Einsatzgruppen , special units carrying on the mass murder of undesirable civilians. Fleeing through the woods, Jakob, like many other Jews in Poland, had his family find refuge in the ghetto in Warsaw, from September of 1939 to July of 1942. During his stay in the ghetto, to combat starvation and protect his family, Max became a skilled smuggler, scrounger and fixer, finding any scrap of food and comfort he could. Hearing rumours about extermination camps, the Eisendhardts tried to sneak out of the ghetto. They were betrayed, arrested and shot. Max was the sole survivor – possibly via unconscious manifestation of his power over the bullets, and more probably thanks to his father interposing his body at the last second. He was sent to the Auschwitz extermination camp in September of 1942. In Auschwitz, through a stroke of luck, Max happened on Fritz Kalb, one of his professors back in Nuremberg. Herr Kalb gave him precious advice that allowed Eisenhardt to survive his arrival at the camp. 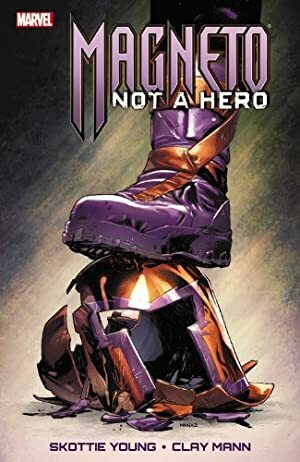 Kalb tried to have Eisenhardt join him in the least awful Kommando (work detail), but back luck had Max end in one of the Sonderkommandos – the work detail running the extermination process, corpses disposal and the handling of the valuables from the victims. Eisenhardt was nearly broken and would he committed suicide until he spotted Magda in the death camp for Romanis at Auschwitz-Birkenau. Now having something to live for, Max became a skilled camp fixer and scrounger, bribing soldiers with gold teeth stolen from Jewish corpses to obtain favours and information. Max fixed events so Magda would survive, and she was on the last train to Buchenwald before the camp for Romanis was closed and everyone killed during the Zigeunernacht . However, the Romanis were sent back from Buchenwald to Auschwitz camp and left to die. Magda miraculously survived long enough for Max to find her in a pile of corpses and smuggle her to his Kommando’s barracks. Eisenhardt was one of the organisers of the October of 1944 revolt at Auschwitz, and his hiding Magda in his barrack was one of the factors that encouraged the Jewish leaders to launch the uprising. Max and Magda managed to flee from the camp, and were not among the hundreds who were recaptured and killed as part of the last efforts to exterminate the Jews. They also survived the chaos that killed many of the survivors of the camps, and rebuild their lives. I’ll try to keep it short. 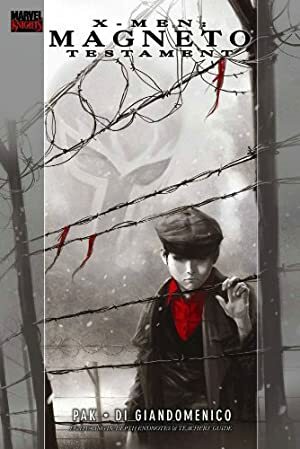 The victim of persecution and prejudice from a young age, Magnus was captured by Nazis and sent to the Auschwitz concentration camp during the Holocaust of World War II. Prisoner 214782 managed to escape, but with deep scars. He vowed never to allow that sort of persecution to affect ’his people‘, the world’s mutants. After the death of his wife and daughter, which he blames the Russians for, he became bitter and heartbroken. Finding another mutant and a kindred soul in Charles Xavier, they quickly became good friends. Magnus’s friendship with Professor Xavier dissolved over their differing solutions to mutant-human tensions. 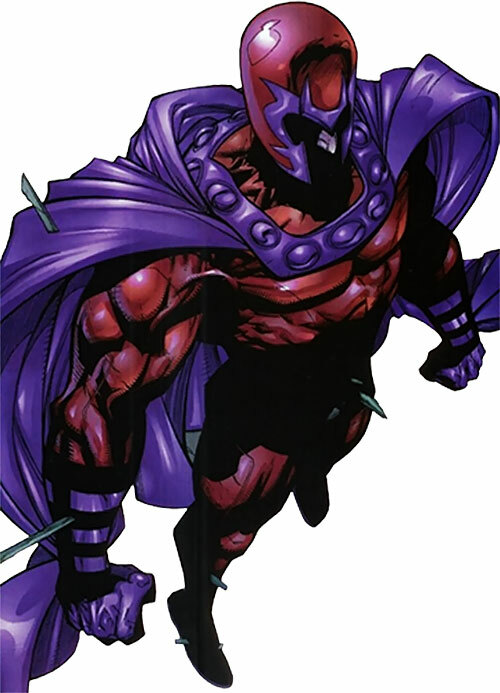 Calling himself Magneto, he formed the Brotherhood of Evil Mutants. The Brotherhood included Quicksilver and the Scarlet Witch, whom he later learned were his children, and the Toad, Mastermind and later the Blob. They began a campaign for mutant supremacy. Some time later, after several defeats at the hands of Xavier’s X-Men, he chose to operate himself for his cause. He occasionally joined up with the likes of the Sub-Mariner, Doctor Doom, etc. He was de-aged into a small child by his genetic creation, Mutant Alpha the Ultimate Mutant, and was placed in the custody of Dr. Moira McTaggert. Later, he was aged into an adult physically around the 30s, at the zenith of his powers. 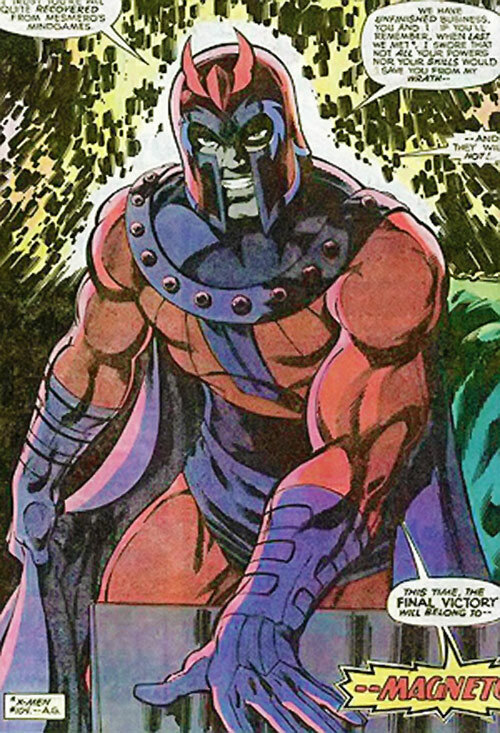 After the sinking of the Soviet, nuclear submarine the Leningrad, in self-defense, Magneto was proclaimed an enemy to humanity by the United Nations. They even created the ’Magneto Protocols’ which goal was to neutralize the threat of Magneto whenever he became a threat again. Magneto then wanted to atone for his past sins and pursue his goal following Xavier’s path instead. He was even prosecuted in court for the mass murdering of the crew of the Leningrad. Although the general populace was very suspecting of Magneto’s motives, he later became a free man. Magneto then became the peaceful leader of Xavier School for Gifted Youngsters for a while (leading the New Mutants and later becoming an X-man himself). He has since returned more powerful and determined than ever before that his previous path had been the correct one. During this mentor era he became a member of the mutant elite cadre named the Hellfire Club in order to pursue his old goals. 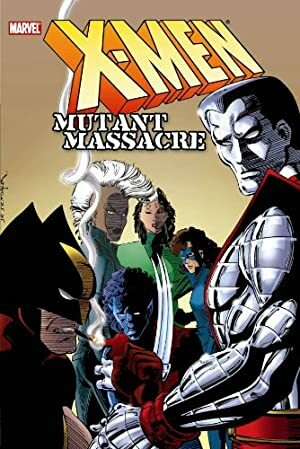 When the Mutant Massacre incident occurred, Magneto’s confidence began waving and he again began to become convinced that he didn’t do enough for mutantkind. When Magneto was again seen as a threat, around the time of the death of Illyana Rasputin (leading his Acolytes from the satellite known as Avalon). 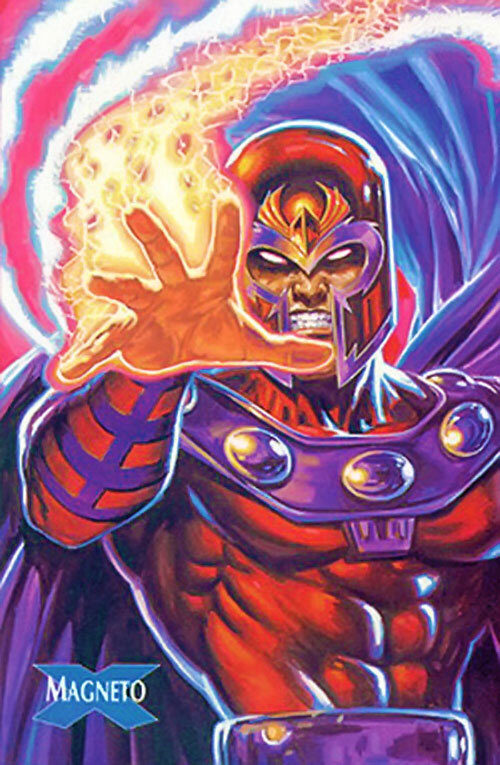 The ’Magneto Protocols’ were activated and an electro-magnetic-based system of satellites were launched that would neutralize the powers of Magneto whenever he was present on the planet itself. As a warning or as self-defense, Magneto then lashed out at the world with a wave of electro-magnetic pulse, stopping all electronic activity entirely. The X-Men made a sneak attack upon Avalon. In the end stopped him completely when Xavier himself mind-wiped Magneto. Unfortunately, Wolverine got his Adamantium skeleton ripped out from him, and he very nearly died as a result. In the end, Colossus, who’d lost his sister and parents, joined the Acolytes in order to tend to Magneto, since he became convinced that Magneto’s more active way was the right way. Several months later a mysterious clone of Magneto, named Joseph, was adventuring with the X-Men in the belief that he was Magneto. However that was not the case and Magneto himself returned again, a larger threat than ever before. Magneto and the Acolytes had a major showdown with the X-Men in the Genoshan capital, Hammer Bay. 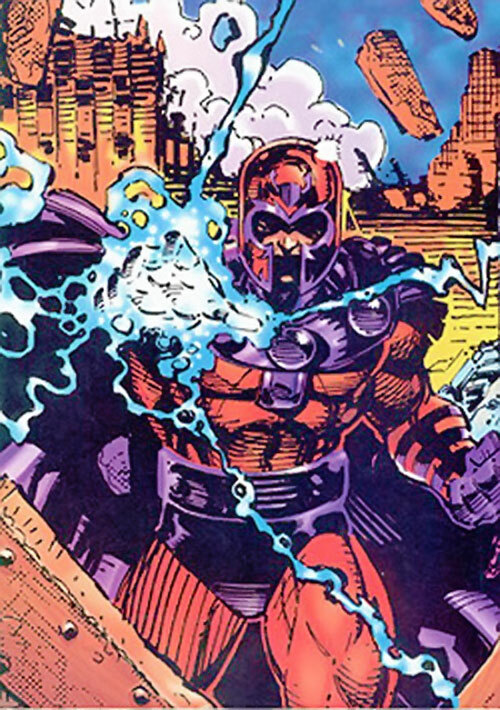 In something akin to blackmailing (Magneto threatened to ’blacken out‘ the world using another electromagnetic pulse whenever he was threatened), and a way for the United Nations to atone for their lack of interference in the civil war of Genosha, the rulership of Genosha was officially handed out to Magneto. The intent was that it become a safe haven for mutants from around the world. Philip Moreau (son of Genosha’s first genegineer, committee member). Jenny Ransome (a victim of the Genoshan mutation process herself, chancellor). Pipeline (former magistrate seeking atonement, committee member). Fabian Cortez (former Acolyte, committee member). Amelia Voght (former Acolyte, emissary). Dr. Alda Huxley (liaison for the United Nations). 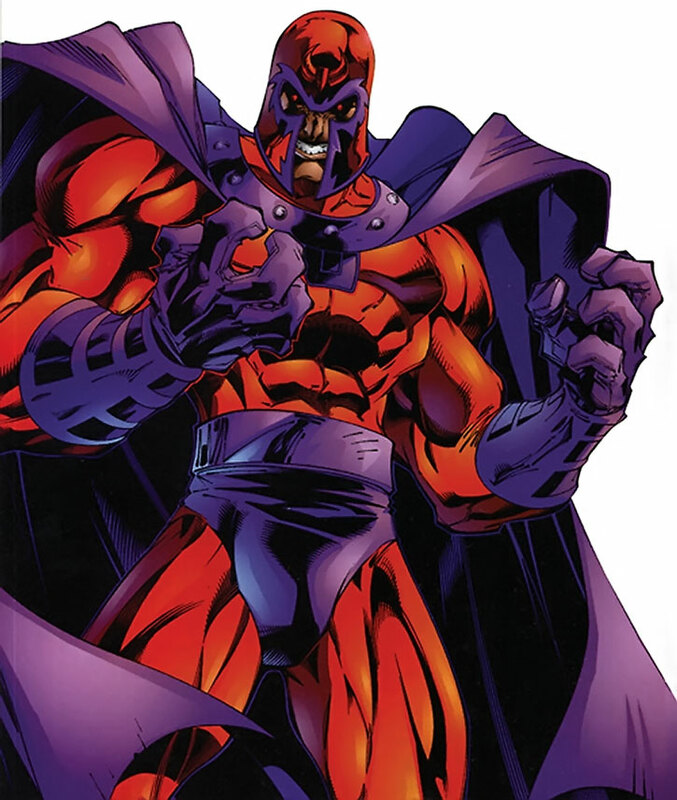 Magneto has an impressive physiological built with strong muscles and huge endurance. His eyes are bluish grey, while his hair, fittingly, is silver-colored, and shaped in the typical Wolverine or Quicksilver style. 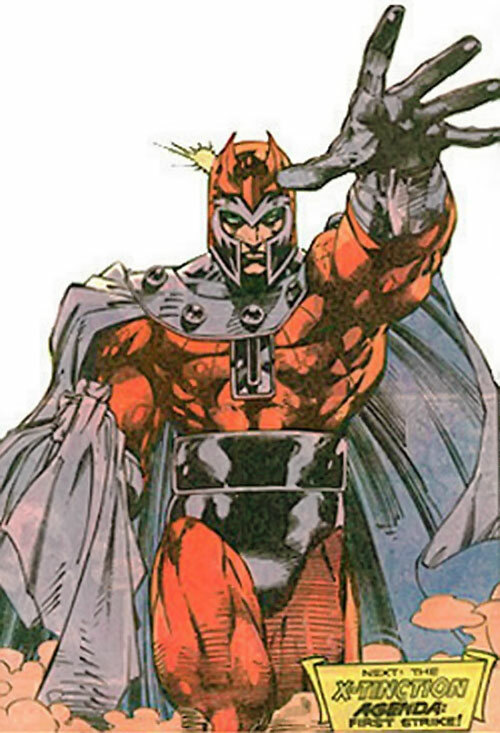 The civilian Erik often bears a fine suit, while as Magneto he bears a battle-fatigued combat suit of own-designed metal alloys. A full-body suit in red (in honor of those that have died). 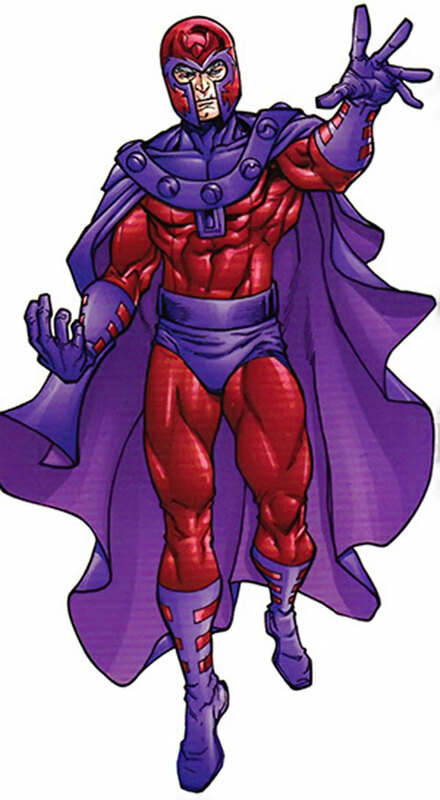 The notorious red helmet of Magneto (fully covering, but leaves the eyes, the nose and the mouth visible; All edges are colored purple and above his eyes is a red piece of two horns pointed at each other). The purple band-formed gloves and boots of metal-reinforced leather. A pair of purple trunks with a purple belt. A fully covering neckpiece in purple metal with large half-spheres of metal attached to it around the neck. A rectangular piece of purple metal on the chest. All this gives the impression of a modern warrior king and is a feared sight for most of humanity. Various body parts, such as the hands, the head or his entire body radiates power on visible wavelengths when he’s using his offensive magnetically-based powers. Erik is the victim of extreme prejudice, which has left him with deep psychological scars. Unfortunately, like many such victims, he has become somewhat prejudiced himself like those who could hurt him and the minorities group he belonged to. But there’s a big difference; he has the power to push back hard. He truly believes that humans can never overcome their fear and hatred of anyone different, so he must protect mutants from human oppression. He has never considered himself evil, since he fights for what he believes is the greater good; if he must do evil acts to attain his goal, so be it ! He has tried many different routes for this, including the conqueror, the mastermind and even the peaceful teacher. For each mutant that dies, friend or foe, his anger grows larger. He feels a great guilt for those who’ve died under his tutelage and protection (like Doug Ramsey, Illyana Rasputin and his daughter Anya) and has vowed never to allow that to happen again. He also feels greatly for his fellow mutants, and will, burdened by guilt, fall down and cry if any are innocently killed. OTHO, he will himself kill mutants that are standing in the way of the cause if need be. In its’ truest sense, he’s a fanatic. It’s also a fact that the use of his powers, ironically, makes him irrational and powermad. He almost becomes more ruthless the more power he uses (in DC Heroes terms, he doesn’t have enough MIND not to be corrupted by his own power). He can be overly aggressive and arrogant at times. Although overly tense at all times, he becomes much worse after prolonged use of power. His feelings toward his own children, Pietro and Wanda, has varied a lot over the years. During his leadership of the Brotherhood of the Evil Mutants they were only pawns to follow his order. Today they’re both lost in their own dreams, but Erik has some hope that Pietro should join his cause. It has been said that while neither man would admit it, Professor Xavier and Magneto are two sides to the same coin; two men convinced that their way is mutantkind‘ only hope. Hmmmm… Magneto’s DC equivalent is Dr. Polaris. Mutants aren’t big in the DC Universe so his goal doesn’t bear very much weight there. Personally I’d keep him as he is, and have the Legion Era’s Braalians, including Cosmic Boy, being his direct descendant from the colonization era. One approach is to have him be the leader of metahumans created by the gene bomb who first try to conquer the world and then go off into space to colonize various superpowered worlds with appropriate metahumans. Cosmic boy would probably see the founder of his subspecies as a hero, no matter what Earth history books say about him (heh, Cosmic Boy might even call himself Magneto 5, Magneto 3000 or the like). If Cosmic Boy does believe in the old mythos, he could be playing the hero in order partly to atone for his forefather’s many sins. Another possibility is to give him an actual country to be pissed about. If he were to have, say, gotten his powers in the nuclear blast the destroyed Qurac, he might make it his duty to collect, empower, and otherwise “free” the random Quracis (or whatever destroyed nation you want to use, since Qurac would presumably wreak havoc on his backstory) that were conveniently out of the country that week. That his “liberations” frequently entail kidnapping legal citizens and non-citizen residents of other countries (like, for example, the occasional Quraci-Americans that crop up from time to time as supporting cast members) puts him at odds with pretty much everyone. By the way, using Qurac probably ties him in to groups like the Jihad from Suicide Squad, which can hardly be a bad thing (it also gives a baseline for his DC-equivalent Brotherhoods). Imagine, for example, him trying to divide the JLA by having the mutants (say, Flash, Batman, and Wonder Woman) rise up against their allies. Flight, Mind Field, Sealed Systems are Usable By Others (+5). Telekinesis may substitute for STR (+3). All Powers have a Minor Power Burnout (-1). Any attempt at Pushing a power is also Fatiguing (-1). Paralysis is only usable with subjects that have/are at least part iron, like humans (-0). Force Field and Mind Field are Diminishing (-1). Sealed Systems is only usable in conjunction with Force Field (-1). All powers are Contingent Upon Magnetic Control (-1). All powers use their AP-levels as their AVs. Although really over 75 years old, he’s been rejuvenated into a young man again, and thus doesn’t have the Age Drawback. Genius, Headquarters (Avalon, Genosha and others, Expansive), Iron Nerves, Language (German and more), Leadership, Scholar (Genetics), Scholar (Mutation), Scholar (Physics), Scholar (Electronics), Scholar (Robotics). Avalon (High, previously only), Hellfire Club (Low, previously High), Magneto’s Acolytes (High), Genosha (High, Powerful), Xavier Mutant Teams (Low, previously only), Quicksilver and Scarlet Witch (Low). Archenemy (X-Men), Authority Figure (Leader of Genosha), Guilt, Mistrust, CIA (Mutant’s benefit). COSTUME [/BODY/ 10, Iron Will: 03]. During his era as a good guy he seemed less efficient with his powers; this is probably because he builds up his powers and his madness by overuse. His good guy days are best simulated by dropping all his powers by about 4 APs during all such appearances. 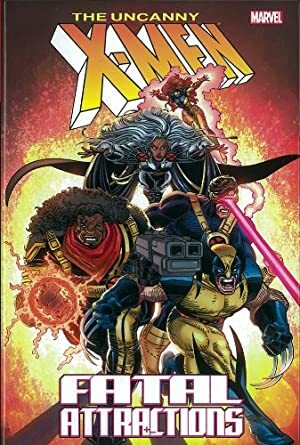 Source of Character: X-Men Comics. Helper(s): Pufnstuff, Paul ’Z‘ Ewande, David Johnston, Nick Yankovec, John Colagioia, Sean MacDonald, Thommy Tsunami.